Arsenal playmaker Mesut Ozil continues to be linked with a January exit with the latest reports linking him with a move to Inter Milan. The Daily Star reported that Inter are interested in taking Ozil on loan but cannot afford to cover his wages. Inter have made it clear that the Gunners would have to cover half of his salary for the move to go ahead. The report claims that an Ozil exit could see Ivan Perisis head the other way. Ozil’s representatives have however, informed Turkish-Football that the 30-year-old will remain at Arsenal over the winter transfer window. The playmaker of Turkish origin will not be leaving the North London based outfit. 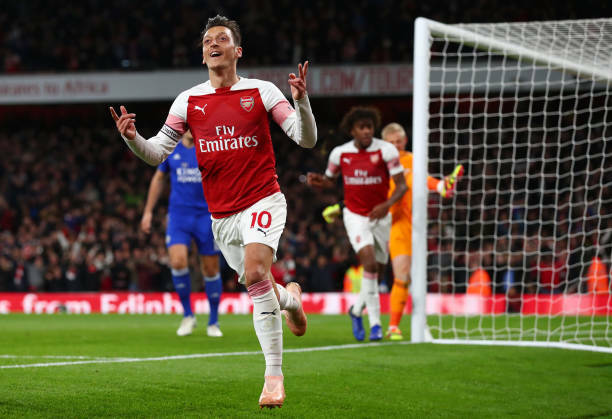 Ozil made his first appearance of 2019 against Manchester United in the FA Cup Fourth Round on Friday that saw the Gunners crash out of the competition. Arsenal manager Unai Emery gave Ozil 25 minutes of playing time in the 3-1 defeat to United. The Gunners take on Cardiff City next in the Premier League on Tuesday, Ozil is match fit but it remains to be seen whether Emery will give him his first start of the season.